Vangeli Zimmerman was 3-0 in singles on Thursday to lift Spring Valley’s boys tennis team to a 15-3 home victory over Tech. Zachary Billot was 2-0 in singles for Spring Valley. The doubles teams of Gerardo Mendoza and Zach Nagel, and Andres Carrasco and Shawn Morton each went 2-0 for the Grizzlies. Foothill 11, Basic 7 — At Foothill, the Falcons swept the doubles sets en route to the win over the Wolves. 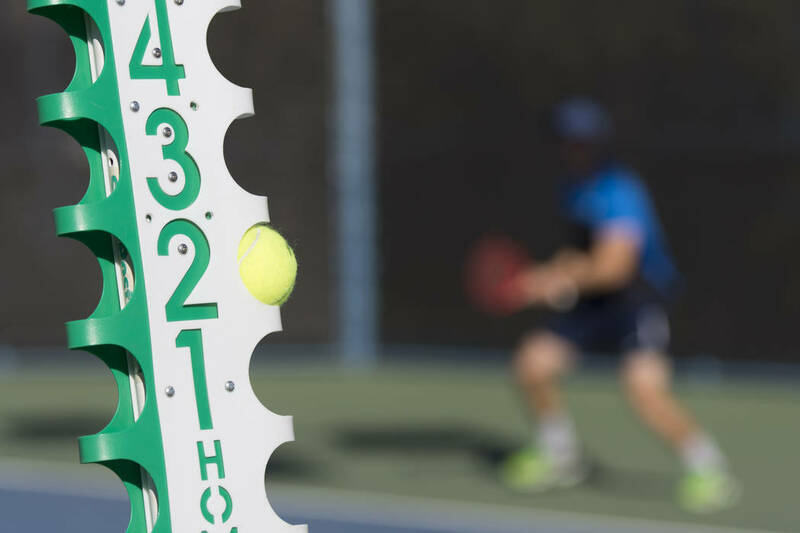 The teams of Ben Crawford and Joel Benavidez, Dominic Gonzalez and Luke Burns, and Landan Henderson and Connor Maroushek each went 3-0 in doubles for Foothill. Carlos Sanchez La Fuente was 3-0 in singles for Basic. Arbor View 15, Las Vegas 3 — At Las Vegas, Michael Webb went 3-0 in singles to lead the Aggies past the Wildcats. Tanner Townsend and Dylan Karn each went 2-0 in singles play for Arbor View. The doubles team of Chad Decker and Kru Kimoto went 3-0 for the Aggies, and the team of Seager Bogden and Blayne Truman went 2-0. Rancho 17, Desert Pines 1 — At Desert Pines, the Rams swept the singles sets to top the Jaguars. Tanner Albright, William Ballin and Joshua McElroy each went 3-0 in singles for Rancho. The doubles teams of Caleb Lewis and Maxwell Hosafros, and Benjamin Ballin and Antonio Ayala each went 3-0 for Rancho. Bishop Gorman 15, Silverado 3 — At Gorman, Max Wolfson was 2-0 in singles, as the Gaels defeated the Skyhawks. Owen Cox finished 2-1 in singles to lead Silverado. Faith Lutheran 15, Eldorado 3 — At Darling Tennis Center, Maxwell Blum was 3-0 in singles to help the Crusaders beat the Sundevils. Hayden Coffing and Carson Richards went 2-1 in doubles for Faith Lutheran. Eldorado’s Miguel Rodriguez and Jacob Harper teamed to go 2-1 in doubles. Bonanza 16, Legacy 2 — At Legacy, Blake Kasday, Chase Kasday and Levon Grigoryan each went 3-0 in singles to lead the Bengals past the Longhorns. The doubles teams of Marshall Nelson and Mark Thuet, and Stone Perry and Jonathan Lai also went 3-0 for Bonanza. Palo Verde 18, Cimarron-Memorial 0 — At Cimarron, Ryan Jensen and Richard Coop were 3-0 in doubles to lead the Panthers over the Spartans. Michael Andre was 2-0 in singles for Palo Verde. Virgin Valley 12, Valley 6 — At Valley, Nicholas Jianu went 3-0 in singles as the Bulldogs doubled up the Vikings. Centennial 12, Canyon Springs 0 — At Centennial, the Bulldogs defeated the Pioneers by forfeit. Shadow Ridge 12, Cheyenne 0 — At Shadow Ridge, the Mustangs defeated the Desert Shields by forfeit. Moapa Valley 12, Chaparral 0 — At Overton, the Pirates beat the Cowboys by forfeit. Adelson School 12, Sunrise Mountain 0 — At Sunrise Mountain, the Lions beat the Miners by forfeit. The Meadows 12, Western 0 — At The Meadows, the Mustangs beat the Warriors by forfeit.